Andi and Tyler’s downtown St. Pete wedding combined romantic garden details with personal touches to capture a simplistic yet classic ambiance. The St. Pete bride and groom turned to Marry Me Tampa Bay to find the perfect location for their local wedding celebration. “I used Marry Me Tampa Bay while I was researching venues and when looking for décor inspiration,” Andi shared. Searching for a reception venue that was unique to St. Pete and naturally beautiful, the Florida natives chose The Birchwood, located in the heart of downtown. 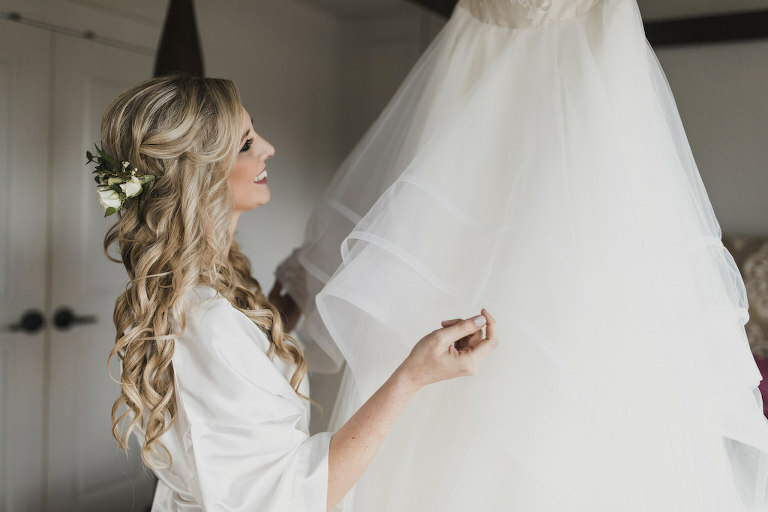 Finding a hair and makeup artist who could create a naturally beautiful style that would hold up throughout the day was a priority for the bride. Reminiscing of the special day, Andi and Tyler enjoyed spending time with family, but one special memory clearly stood out. “I think one of the most memorable moments for me was reciting our vows. 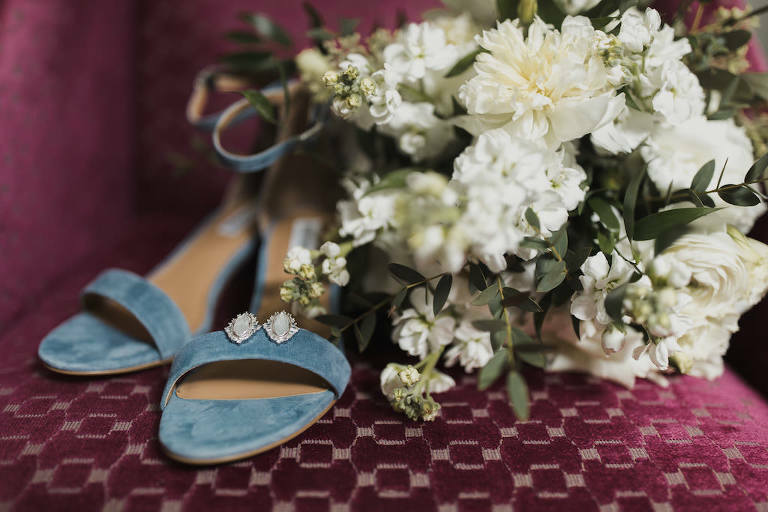 I was very focused on getting the words right so I was hyper-aware and in this moment, more so than any other!” the bride reminisced. 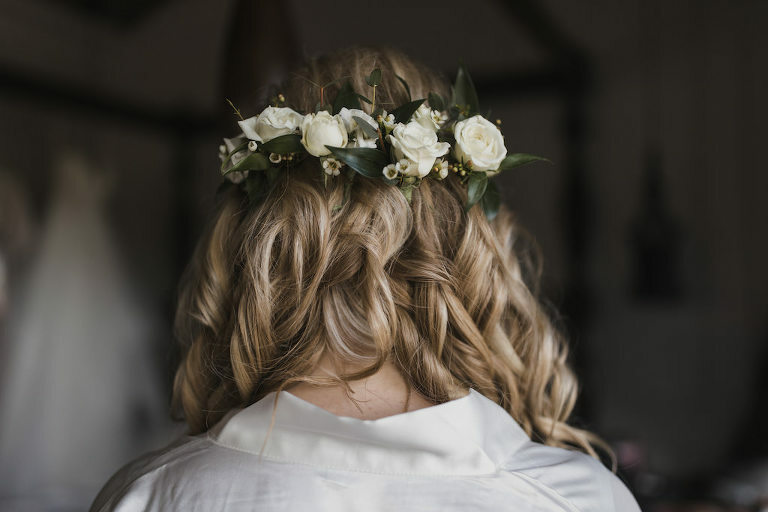 What was your wedding day beauty inspiration? Simple yet elegant. Since I wouldn’t be wearing a veil I’d want to wear my hair down. I wanted something soft and romantic for my hair that would still hold up the entire day, and makeup that was bold for photos, but not overdone. Michele Renee The Studio came highly recommended. I was happy with my hair and makeup on the big day; they did a great job listening to what I wanted and being patient with me when I changed my mind. We tried to go for an elegant, garden-style type feel. We wanted lots of greenery, white florals and gold accents. I tend to really gravitate to simple, understated elegance and this theme really seemed to fit our style and that of both the venues. Everything was very neutral: white florals with bursts of greenery. My bridesmaids wore very light beige. Tyler and his groomsmen wore navy suits with beige ties. We had white and gold accents at the reception. We selected koozie colors that represented each of our colleges. One batch in garnet and gold for Tyler’s alma mater, Florida State University and one batch of green and gold for mine, University of South Florida. Our wedding colors were so neutral that it was tough to pick a color for the koozies, so it was a fun customization that represented each of us. Tyler proposed in Germany on our first trip overseas on the grounds of the Linderhof Palace near the Austria border. Something that could stand on its own and be beautiful without much décor, also something that felt unique to St. Pete. The Birchwood ballroom is so beautiful and the location is second to none. During the whole process, everyone made wedding planning so easy and enjoyable. I was incredibly pleased with the service they provided, and was even more thrilled with the food! For the size of our wedding, the pricing was something that worked really well for us, plus the dining options were really standout. Truly not your traditional wedding food! Try to relax and take it all in! Learn to enjoy every moment and don’t sweat the small stuff! Even though it may seem big on the day of, it’ll only distract you and take away from your day and your memories if you let it get to you. Seriously, just forget about it. Oh, and take your honeymoon immediately, don’t delay!